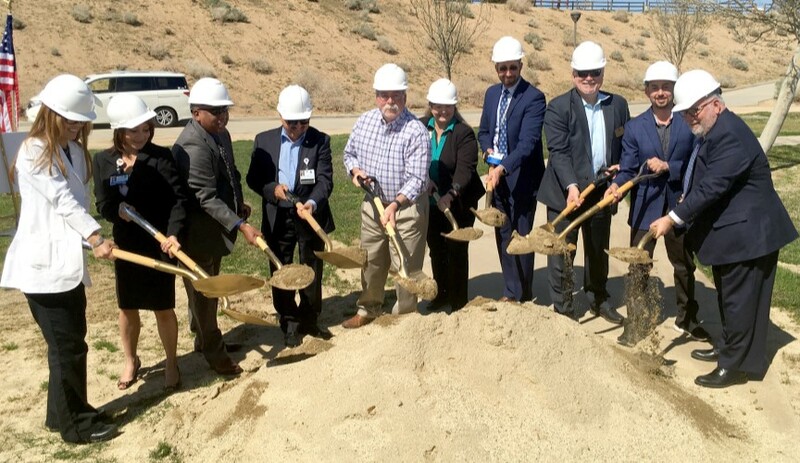 PALMDALE — City of Palmdale elected officials, along with representatives from Antelope Valley Hospital and Kaiser Permanente gathered at Pelona Vista Park in Palmdale Monday to break ground on a new community Fitness Court. The Fitness Court will be a best-in-class outdoor bodyweight circuit-training system, featuring more than 30 pieces of exercise equipment arranged in stations that allow for up to 28 people to use the court at the same time. The circuit-training system includes a series of full-body exercises that can be completed in just seven minutes. The 7 Movements in 7 Minutes is a simple yet powerful workout created for a range of athletic abilities that is shown to burn more calories per minute than most other forms of exercise. The project is made possible through funds from Antelope Valley Hospital, the presenting sponsor, as well as support from The Kaiser Foundation and an NFC Fitness Grant from official music sponsor Fit Radio. The community Fitness Court is expected to be open for use in April at Pelona Vista Park, located at 37800 Tierra Subida Avenue in Palmdale. 15 comments for "Ground broken for fitness court at Pelona Vista Park"
This is so great! Can’t wait until it’s finished to try it out with the family. When will we get skate park? Palmdale Mayor Steve Hofbauer looks like a prime candidate for a massive heart attack or a crippling stroke. Should these people be in their work stations being productive instead of pretending. It”erks” me to see not only this but also when Garcetti has a bunch of officials behind him in in a press release when they should be working. Not only Garcetti but all those that can’t stand up alone without their entourage. And I know a Trump Hater will be chiming in. Get real! Politicians elected by the people, both in Lancaster and Palmdale. That’s how it works in the good ole U.S.A.
Are you overeating because you didn’t like the politicians the people voted for? They don’t like themselves as they eat to overcome being dominated. They wanted to win at any cost, now they realize the error of thier stupidity. In Lancaster it is pay to play. They own you lock, sock, and barrel. They’ll even take off their cowboy hat at the rodeo after drinking Marv’s private stage and say to themselves God Bless the U.S.A.
11.2% voter turnout is appalling! You only have yourselves to blame for not showing up to vote them out. The people in Lancaster know what’s going on and do nothing but complain. Complaining doesn’t change anything, (Lancaster Cowboy), but you just can’t connect the dots. He counts on low voter turnout, and you lazy people hand the power right over to him, and his accomplices, four times! It’s the fault of the people for doing NOTHING but complaining. At least the voters turned out to elect the politicians they wanted in Palmdale. Follow the money, Alexis. Lancaster got the politicians they wanted and paid for in Palmdale. Lancaster money and control is the problem here in Lancaster and now in Palmdale. Rex and Marvin donated thousands of dollars to elect their candidates so they could control the whole Valley. You can’t win elections without money. Palmdale was once a beacon of hope in this corrupt place. Now it is just as bad. So 89% of Lancaster voters were paid off? Well, you go ahead and believe whatever you want. I know that apathy keeps these guys in power. Looks like the Mayor and City Council could use a few workouts on this. They must be overeating from the stress of Lancaster telling them what they can or cannot do in Palmdale. They have no choice or Rex and Marvin will replace them with people who will do what they are told. No backbone required. Looks like they are on Marv’s fitness plan. They sure eat and drink enough together. It’s your fault for being so lazy, and choosing a public forum to have your hissy fits. When the fitness court is finished, you and your friend might consider a workout to get rid of your angst. I would whoop them in a fitness contest. Eating contest? No way. They’ve got me beat. You should see them pack it away at Bex. That is when Bex was still in business. All the food, all the booze. Some of the best wheeling and dealing money can buy. A legend in your own mind, I see. The voters like them in power (four terms). What a shame that it has to be this way because of voter apathy.